As usual I’m running behind, but my latest excuse is that we’re traveling… and not in our usual way (taking our home with us). This trip involves an actual airplane, though the flight from Petersburg to Seattle was slightly delayed because they had to chase a porcupine off the tarmac. How very Alaskan. We flew to the east coast for a multi-stop trip to visit some family and friends, and for some other adventures that I’ll save for the next posts. It’s a mix of wonderful things and difficult things as we spend time with people very close to us who are confronting grim illnesses. It’s hard to keep going forward with our plans and adventures while people we love are struggling so much. We will be there for them when they really need us, and in the meantime we want to make as much of our own time here on earth as we can – it’s not an easy balance to find. I’ll keep the blog focused on the upbeat interesting things, but our hearts and minds and prayers remain focused on the people we love. Hurricane Matthew rearranged our plans and the plans of many other people, causing the cancellation of the DeFever Rendezvous. Fortunately no one that we know suffered any major damage or impact from the storm. Eventually we made it up to Rhode Island to link up with boating friends, and we got to spend a couple of days exploring New England with glorious fall color and unseasonably warm temps. 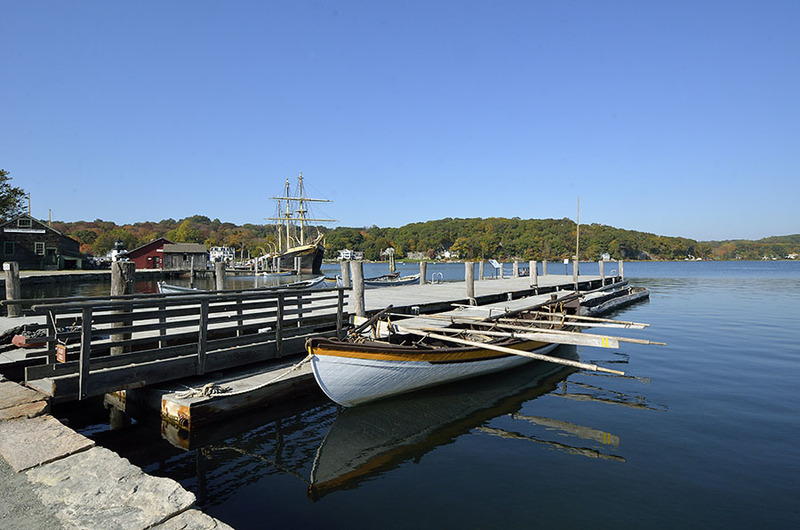 First stop: Mystic Seaport in Connecticut. 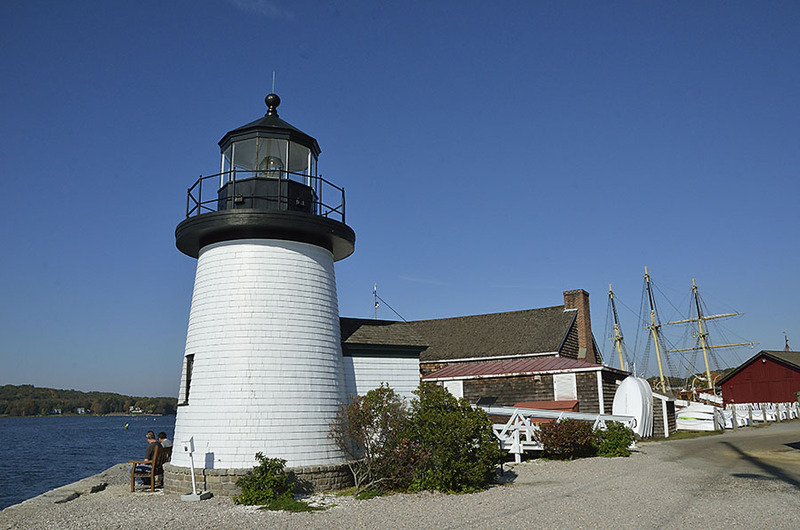 Mystic is a living, working seaport museum focused on the whaling and trading history of the area. I remember going there with my parents as a little girl several times – always a favorite place with great memories. 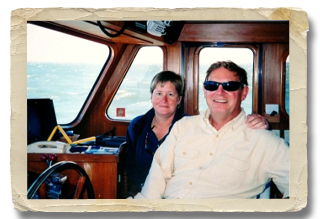 Jim and I have been there twice with our boat, which was beyond my wildest childhood dreams – so special. We love it there, and we even spent time there the day after we got engaged. Boats are in my blood. Now we got to go there again with friends on a beautiful day – perfect. 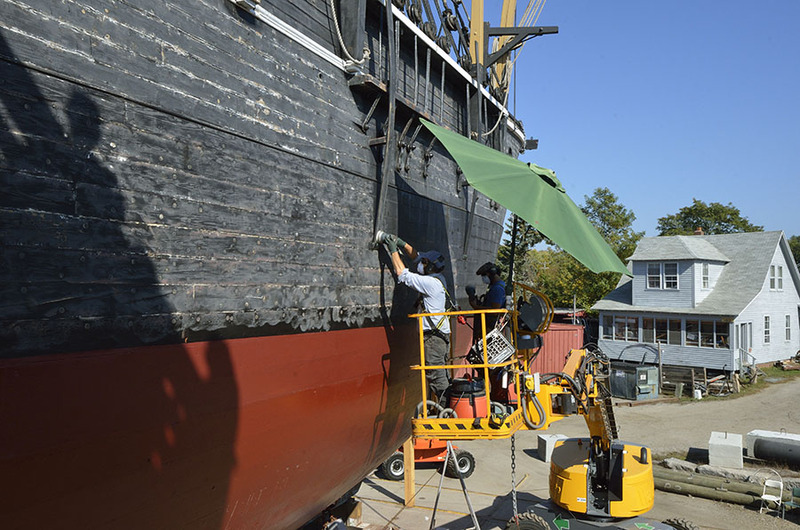 We checked out various demonstrations, stopped by to see one of my two favorite boats there – the BRILLIANT (the other one – a Sandbagger, was already tucked away for winter), and we climbed up to the deck of the CHARLES W. MORGAN to see how the renovation is coming along. The MORGAN is 133′ long, built in 1841 for whaling. Imagine the challenges of maintaining such a huge wooden vessel! She’s almost ready to go back in the water, and she recently had a successful test and short cruise in Long Island Sound. 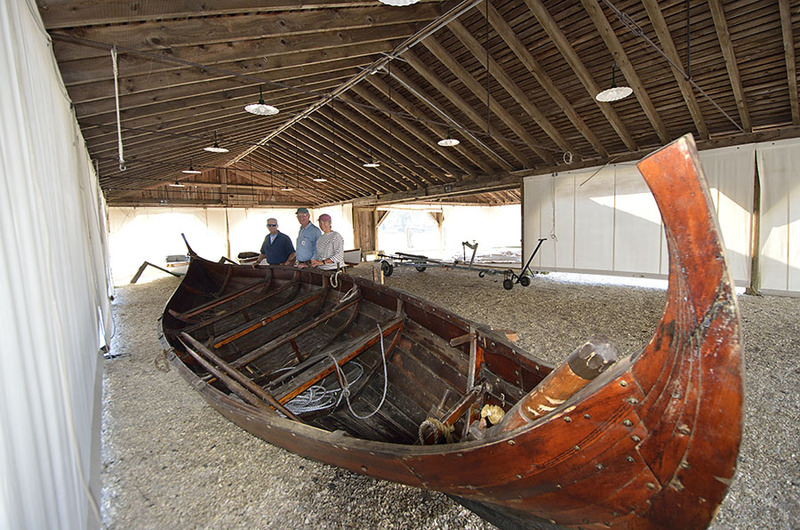 The other special treat was getting to see the Viking longship Draken Harald Harfagre that sailed across the Atlantic from Norway to the U.S. this past summer. We missed the lecture from the ship’s captain about the history of the longships and about the Draken’s voyage, but it was still neat to see her and to get a closer look at the traditional clinker-planked construction. 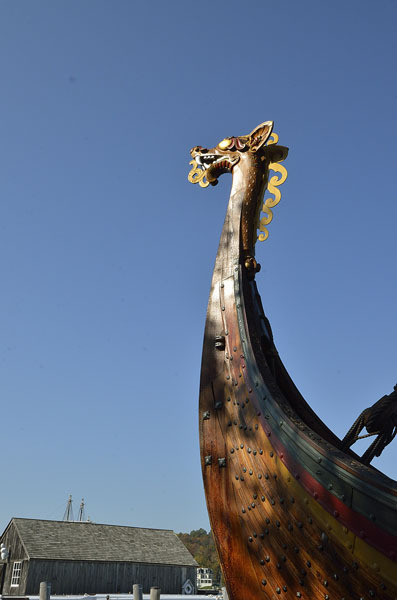 There were carved designs at both ends, and the dragon on the bow was most impressive. 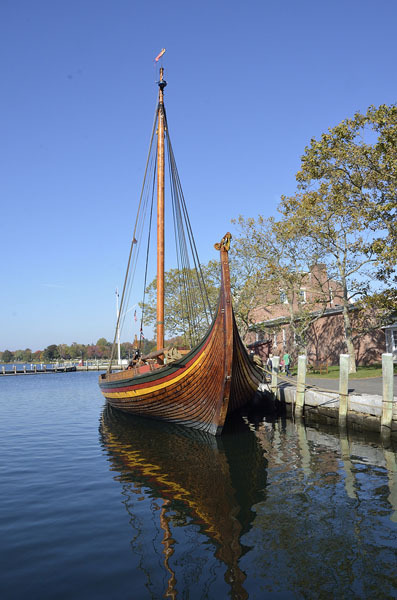 Living in Alaska’s Little Norway and having Norwegian ancestors (my great-grandfather came from Mandel Norway), it was special to experience a little Viking heritage on a sunny day in Connecticut. They also had a smaller longboat on display, and we noticed how similar it is in shape to the Tlingit log canoes. The construction is completely different, but the length to beam ratio and high ends were remarkably close. It always surprises me to see how quickly the weather patterns change from summer to fall up here. 18+ hours of daylight at the Summer Solstice is now about 10 hours, and we’re losing daylight at the rate of about 5 minutes per day. Strong weather fronts start coming in off the Gulf of Alaska, and it’s not the nicest time to be out on the water if you don’t have to. The good news? 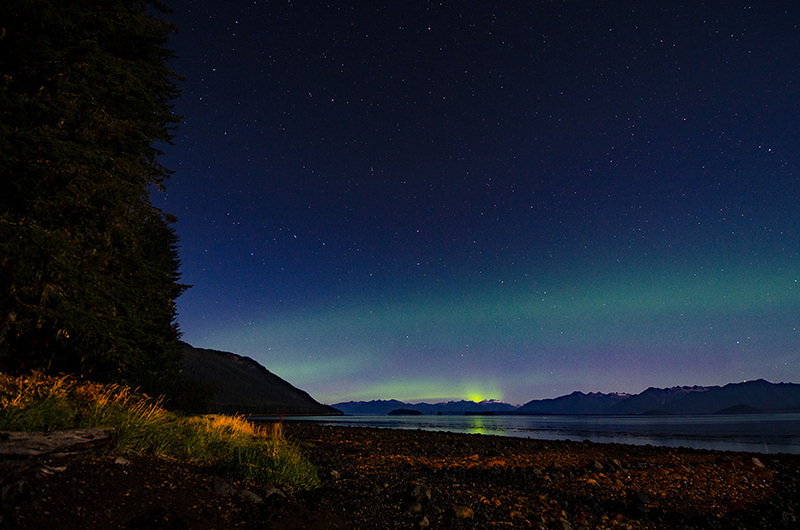 It’s now dark enough to see the aurora borealis on a clear night, and when the aurora activity is far enough south. The aurora wasn’t too bright this particular evening but it was still pretty to see, with Ursa Major (the Big Dipper) and the north star – the symbols on Alaska’s flag – just above the green light. The end of the summer cruising season gave us a chance to make a change to ADVENTURES – something we’ve been considering for a long time: a bulbous bow. Without going into lots of technical detail, suffice it to say that a bulbous bow is a rounded protrusion under the water that helps break waves and improves efficiency. It doesn’t look like it would do all that, but it does very effectively. DeFever-designed boats perform very well in the ocean, though they are known to “hobby horse” when waves are directly on the bow – we get a lively ride in a head sea. 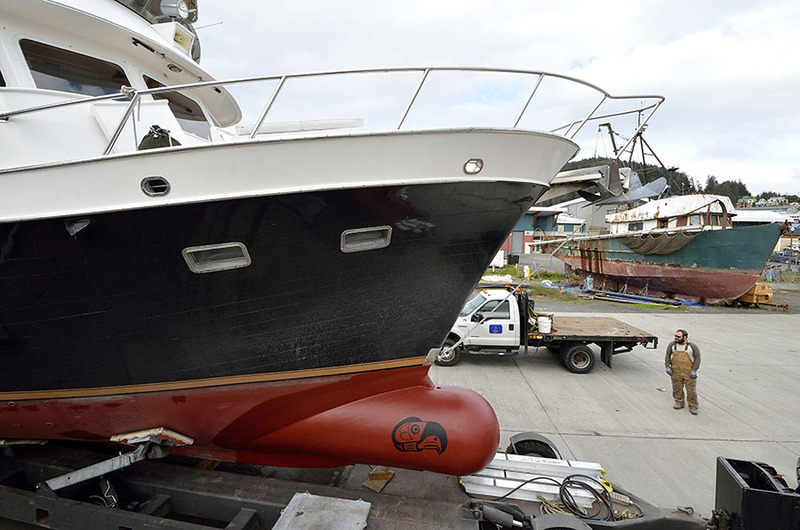 We’ve been interested in a bulbous bow to help dampen that motion, more than to improve speed or fuel economy but we never though we’d find someone with the knowledge and experience to scale a bulbous bow for a boat of our size… until we met Steve Keller in Wrangell. We asked our commercial fishermen friends and they all spoke highly of bulbous bows and of Steve’s work. Jim did his own deep dive into the science and math of bulbous bows, comparing his findings with Steve’s recommendations. Everything matched up, so we decided to take the plunge. Here are a few photos of the process and the final result – spare us the snarky comments about what it looks like. 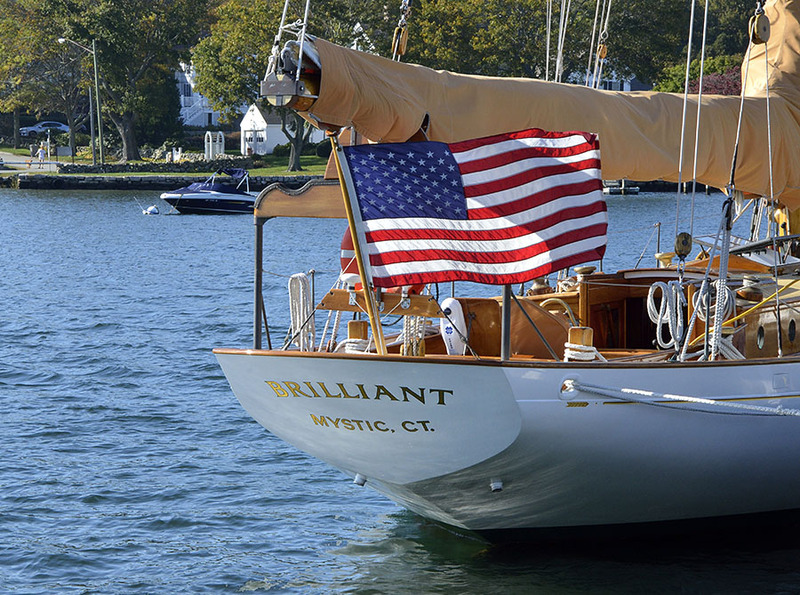 Boats are known as “she”, and… we like to think of ourselves as more “transgender” now. 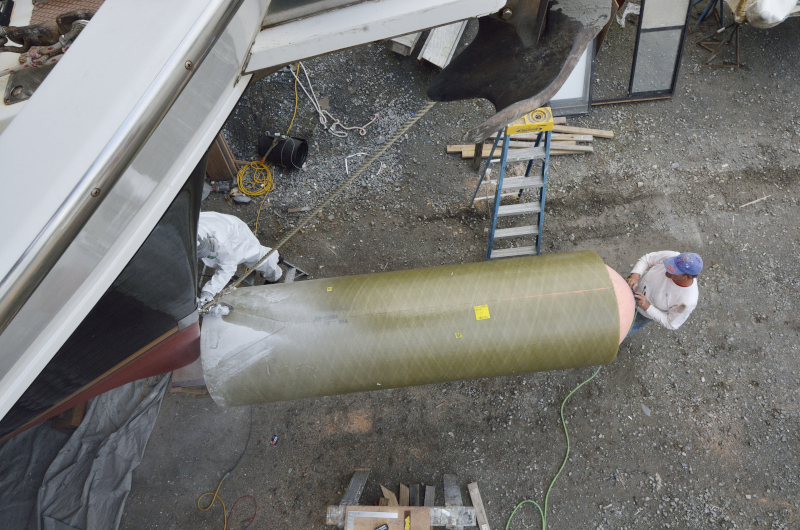 We started out with a 10′ long, 3′ diameter fiberglass cylinder 3/4″ thick and weighing 700 lbs. There was a LOT of leveling, measuring, marking, re-measuring, test cutting, and more re-measuring before the final cuts were made to make the cylinder fit snugly to the curved sides of ADVENTURES’ bow. In the photo above, the 10′ long cylinder is still 10′ long… but most of that length is on either side of the bow, and only a couple of feet extend beyond the bow at the top. A large ball buoy was inflated to fit the end of the cylinder, and used to mold the dome. 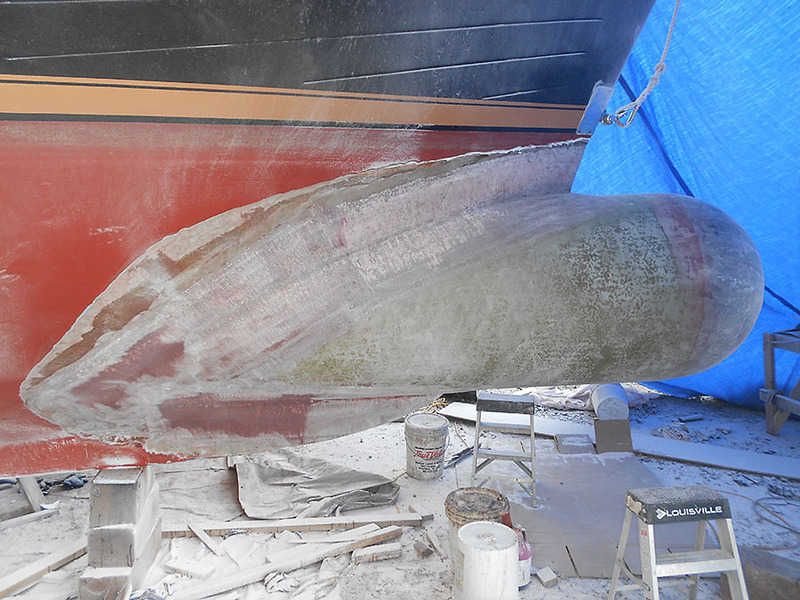 I’m skipping over a lot of intermediate steps, but here’s the cylinder and dome mated together and fiberglassed to our hull. The overall weight of this addition is over 900 lbs, carefully calculated by weighing the original cylinder, weighing the big pieces cut out of it, and keeping track of the yards of fiberglass cloth and gallons of resin used to construct everything. It’s important that the finished bulb doesn’t make the boat ride lower at the bow – instead we want it to be neutrally buoyant or very slightly positively buoyant. There is a lot of math that goes into scaling and balancing a bulbous bow like this, on top of the skill to construct it. Our bulb has both air and water chambers to achieve the proper buoyancy. 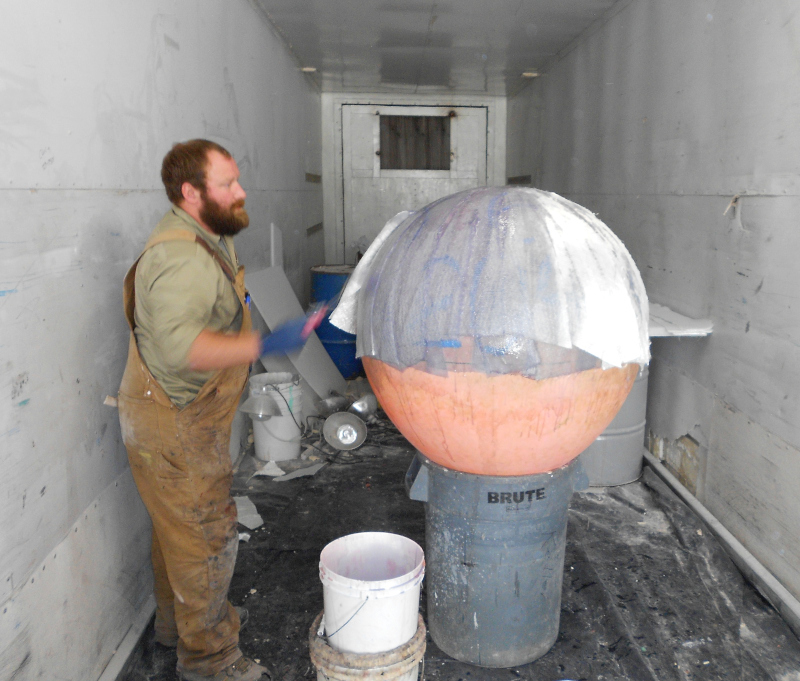 Steve constructed a bulkhead inside the bulb to trap enough air in the aft section to offset the weight of the fiberglass as well as the weight of the water that will be carried in the front section. The dome end of the bulb has two 2″ holes drilled in it (top and bottom) to allow water in it so it’s not too buoyant. This really was a fascinating project. This is the final result, after sanding and fairing, epoxy barrier coating, and bottom painting. 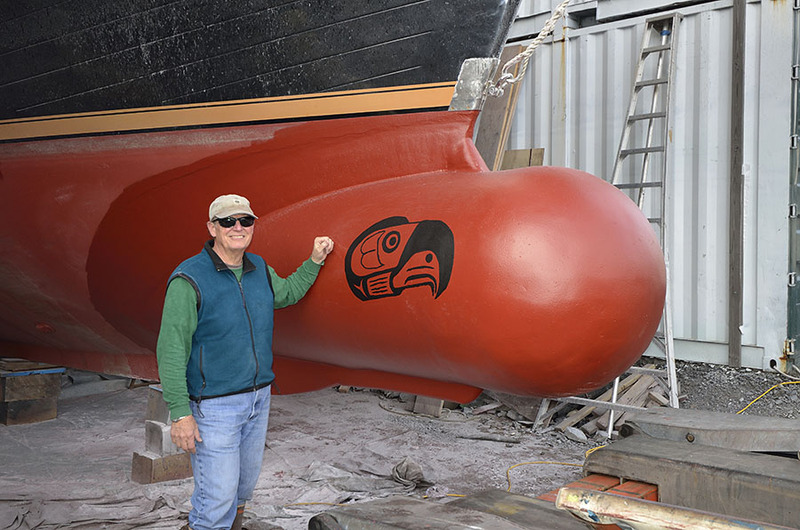 The native style eagle head was Jim’s idea – he drew it, created a large-scale stencil for it, and painted it on each side of the bulb with black bottom paint. Pretty spiffy! The whole process took about 10 days, and living in a boat yard shed with all the grinding and sanding dust was not fun, but the guys were great to work with and the project was a good intellectual challenge. We’re very pleased with the result. 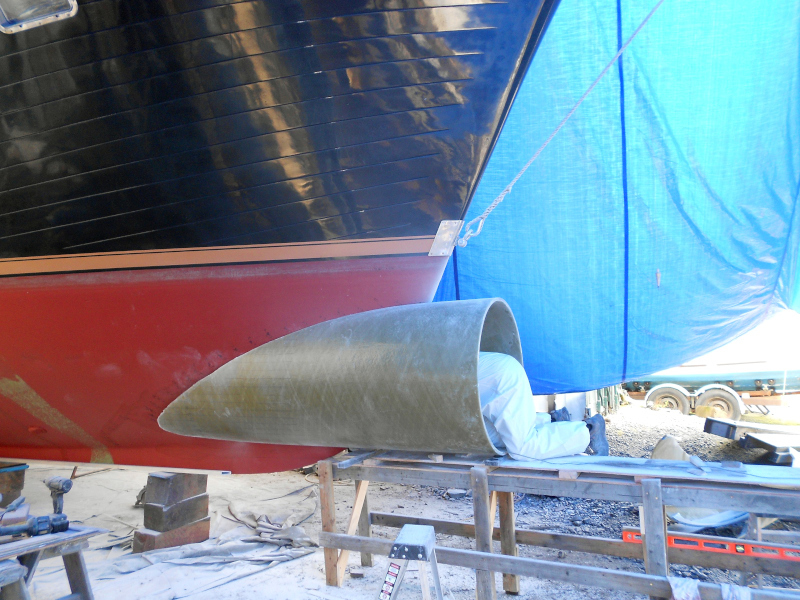 Now we just need lots of sea time with the new bulbous bow to see how the boat’s ride will change. We cruised the 40 miles back to Petersburg, and it was the one time we were disappointed in having flat calm water! The biggest wave we could find was a ferry wake, so we’ll have to wait until the cruising season starts in the spring to really give the new bulb a thorough workout. We definitely saw a big speed improvement, and felt some differences in the ride. Docking is a little different now – with the extension up front the boat doesn’t want to make sharp 90 degree turns the same as before, so it will take some practice to see how much more rudder to use and where to line up. We’re really looking forward to the boating season starting up again in the spring, especially now that we have a new “toy” to experiment with, and an improvement in ride when the sea is on our nose (as often happens in the long channels that funnel the wind up here).